24000mAh can support long-time use and any outdoor activities. It can receive any light source and then turn them into electricity which can be used for emergency. You can double press the power button which is on the left side to turn it on. You can use the item to charge three devices simultaneously or share it with your friends conveniently. It is very portable for you to carry around. If you have any questions,please feel free to contact us.We must try our best to fulfill every customer's requirement. 1.When the item is receiving solar energy,its blue lights will be flashing automatically. 2.For the first few times'using,we suggest that customer can fully charge the item and then run it out of power back and forth several times. In this way,the charging status of the item will reach at the highest capacity. 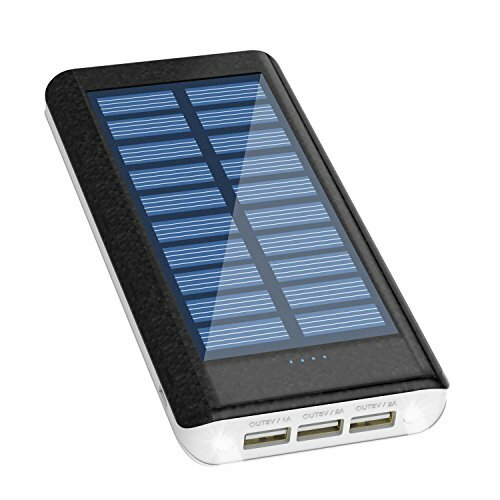 1.Capacity Of Solar Charger: 24000mAh Ultra huge capacity can provide your phone or other devices with enough electricity so that you will have no worry again. 2.Solar Charging For Backup Battery:It can be used as an assisted charging method When you are outside and out of charging resources for EMERGENCY. 3.Power Bank With Bright Flashlight:This charger comes with flashlight function which may be used for illumination in the dark. 4.Battery Pack's Three USB Ports:You can plug three devices into the item simultaneously and conveniently.It is really a shared product. 5.Warranty Period Of Portable Charger:24 months.Welcome to contact our professional after-sales department no matter when you get any problems in this period. If you have any questions about this product by HuaF, contact us by completing and submitting the form below. If you are looking for a specif part number, please include it with your message.